thought you all might like to se this card my DS Mark got for his birthday. Its is his birthday on christmas day and my nieces boyfriend made him this combined card. He is in prison ( the boyfriend not Mark) so has very limited resources to use , no scissors or coloured card. The ice hockey player and badge were cut from an old programme but the rest hes drawn himself mainly with nail clippers! wow ! glad to see he is using his talents elsewhere now ! 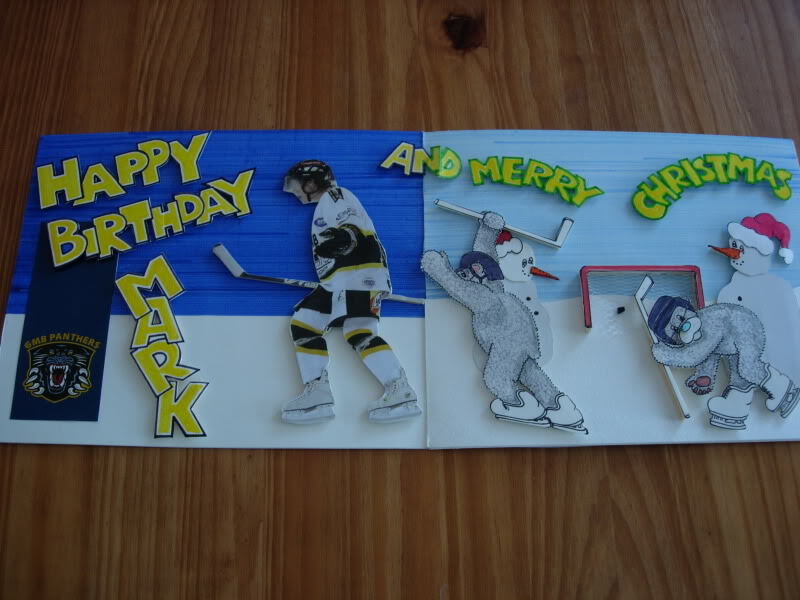 its a fabby card i bet mark was thrilled to bits with it . oops just read back what i'd written and I meant to put he cut things out mainly with nail clippers Doh!! Yes Mark was really pleased. talents to good use when he gets out. Amazing, it must have taken hime ages. I hope he's found his niche now. tremendous results from such a difficult situation... just shows what can be done. That's excellent, Dawn. He did a real good job there. Part of me wants to send him some 'proper' craft kit and part of me thinks, well he doesn't need it if he canproduce that from nothing. What an inspiration. Please pass on our admiration. thats fantastic cant imagine the patience and time put into cutting all those words out and from scratch wow!!! jcrulesfootball wrote: thats fantastic cant imagine the patience and time put into cutting all those words out and from scratch wow!!! I would imagine there's a lot of time to kill in prison. I wanted to send him some proper stuff too Karelyn but hes not allowed parcels and if you visit yu can't take anything in for him. He uses cut up matchsticks for the decoupage stuck on with glue.